People that snore often do nothing to stop snoring. People with sleep apnea frequently use Continuous Positive Airway Pressure (CPAP) machines to force air down the air passages. Sleep apnea sufferers put a mask on their face. The mask is connected to a tube, which is connected to the CPAP machine. When the machine is turned on, it opens the airways. However, people who use CPAP machines find them to be cumbersome, inconvenient, noisy, and hard to travel with. As a result, they don't use them. This puts their long-term health at risk. 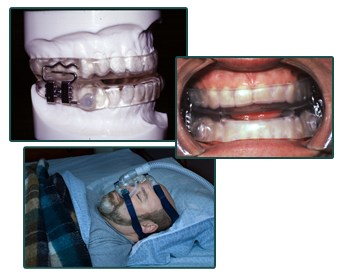 Aspen Dental Sleep Medicine and Dr. Kaniff treat obstructive sleep apnea with custom adjustable mandibular advancement devices. These oral appliances have been cited by the American Academy of Sleep Medicine as an effective alternative to CPAP machines for people with mild to moderate obstructive sleep apnea, and sometimes for people with severe sleep apnea, 2015 Clinical Guidelines: JCSM. An oral appliance is a small, lightweight device that fits over the upper and lower teeth or tongue (similar to an orthodontic retainer or mouth guard). This device slightly advances the lower jaw or tongue, which moves the base of the tongue forward and increases the airway opening laterally. This improves breathing and reduces snoring and sleep apnea. The appliance is individually customized for each patient by Dr.Kaniff. Her 20 years of experience in the treatment of snoring and sleep apnea, optimizes these devices. The appliances are comfortable and well-tolerated by most patients. They are easy to place and remove. Cleaning the device is easy and they are most convenient for travel. What percentage of people find an oral appliance to be effective? We have found that about 70% - 100% of the snoring is eliminated, with 70-80% of mild to moderate sleep apnea treated successfully. For patients who snore without sleep apnea, that number is higher. Will my appliance be covered by medical insurance? Yes, once a diagnosis has been made by a sleep physician, a prescription for an oral appliance is given to the patient and insurance pre-certification is submitted by our office. How long will it take to adapt to the appliance? Will it hurt my teeth? Usually a few days of adjustment to the oral appliance are common, which may include occasional tooth or jaw muscle discomfort. How long do these appliances last? With proper care, these appliances can last five years or more. They may need to be re-lined with material to increase their retention over time. What's the difference between snoring and obstructive sleep apnea? Snoring in its most benign form is just a sound created by air flowing around and vibrating the moveable throat tissues. Sleep apnea is an actual closing off of these throat tissues. How many visits are involved with the appliance? 1-3 appointments for diagnosis and treatment. We use various modalities to find the optimum "sweet spot" of the airway opening, thus preventing airway collapse. Once the devices is given to the patient, several visits are needed over 3 months to properly adjust the device, followed by a sleep study to test effectiveness of treatment and adjust as needed. These protocols can make the devices 30% more effective. Yearly follow-ups insure appliances fit properly, with adjustments as necessary. A reminder: obstructive sleep apnea gets worse over time.